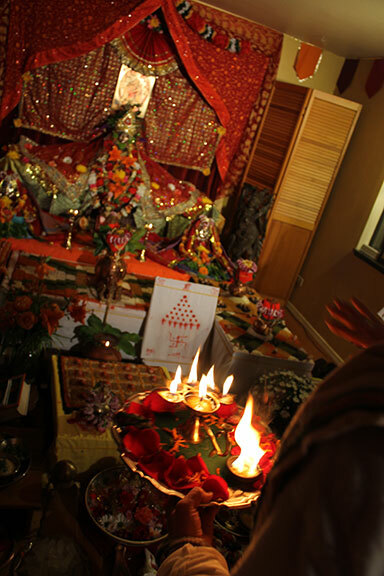 -Join us in offering as we say good morning to Ma with a simple Pancha Puja and Arati. Singing is encouraged! The temple awakens as we prepare for a full day of worship. -These 700 verses of mantra depict the story of Goddess Durga and her many forms as she destroys many powerful demons. Also known as the Devi Mahatmya, the Chandi is a story of the negativities within us and how they are overcome. -During this time we invite you to come and sit, sing, chant, or offer any type of prayer that calls you. One can also sit in meditation during this time. -The main altar will be closed for public view during this time as Ma changes her clothes and prepares for her evening ceremony. The temple will be open as usual and will be open 24 hours a day for all 9 days. -Activation of the Yantra of the Goddess. -The evening begins with a small talk about the evenings ritual. Then begins an elaborate ceremony of Divine Mother worship (Durga puja). We offer milk, flowers, fruits, delicately prepared foods and decadent sweets. We offer songs and chants, and most of all our hearts. 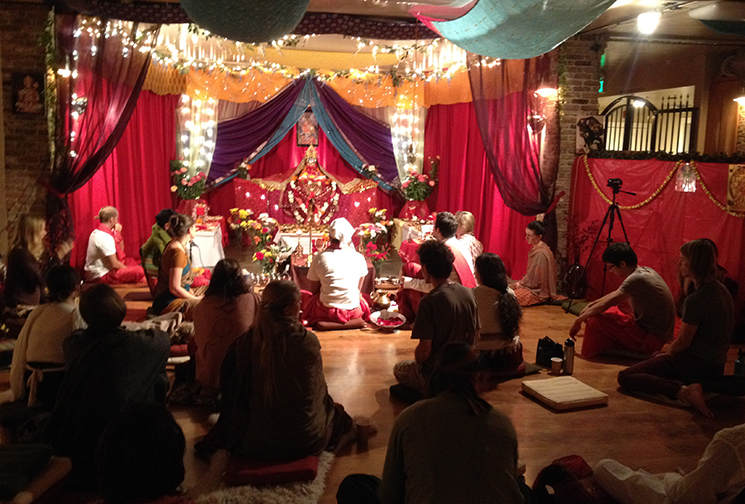 Organizer contact: Veeru Tripathi– Priest 530-615-1110; or to volunteer contact Meenakshi. -See the Musical program for more details. -Enjoy a traditionally prepared vegetarian Indian meal as well as chai, herbal tea, and fruits and sweets that were offered to Ma during the puja. Join us as we sing to the Goddess in call and response. Devotional singing is the most important part of a puja ceremony. -Each night will feature different headlining performers offering their art and love to Ma. Join us as we celebrate the abundance that Mother gives us.